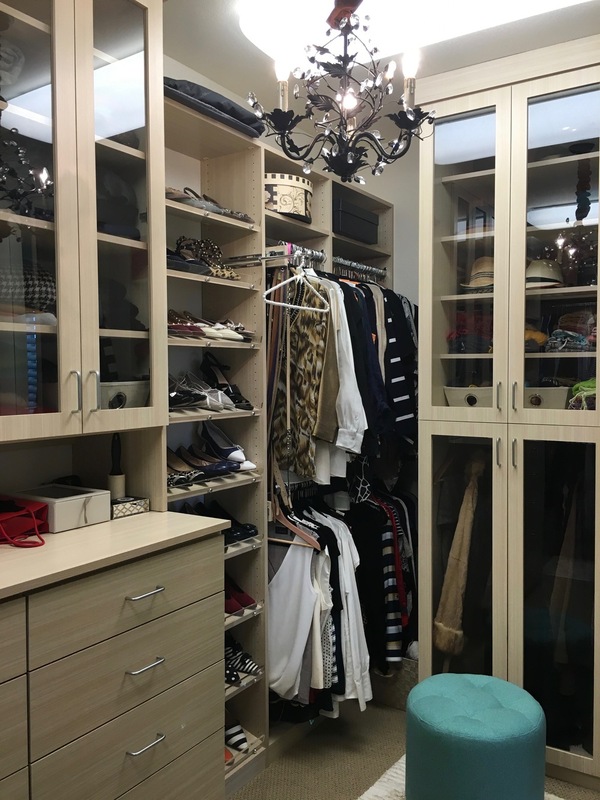 An exceptional creation by Malka and the RC Cabinets & Closets team. A beautiful walk in closet in the Silverado Country Club of Napa County our neighboring Wine Country. Constructed in a very high quality textured melamine that is produced in the United States by American Laminates. Included in this wonderful wardrobe are glass Shaker style doors, backed with cedar wood to house the client's fur coats. In the corner we had room for a water fall scarf rack for a selection of the client's silk scarves. Drawers include an uniquely custom organized Treasure Drawer for the husband and a elegantly outfitted jewelry drawer for the wife.